An impoverished surfer has drawn up a new theory of the universe, seen by some as the Holy Grail of physics, which has received rave reviews from scientists. 19 March 2007: Is this the fabric of the universe? Although the work of 39 year old Garrett Lisi still has a way to go to convince the establishment, let alone match the achievements of Albert Einstein, the two do have one thing in common: Einstein also began his great adventure in theoretical physics while outside the mainstream scientific establishment, working as a patent officer, though failed to achieve the Holy Grail, an overarching explanation to unite all the particles and forces of the cosmos. Now Lisi, currently in Nevada, has come up with a proposal to do this. Lee Smolin at the Perimeter Institute for Theoretical Physics in Waterloo, Ontario, Canada, describes Lisi's work as "fabulous". "It is one of the most compelling unification models I've seen in many, many years," he says. "Although he cultivates a bit of a surfer-guy image its clear he has put enormous effort and time into working the complexities of this structure out over several years," Prof Smolin tells The Telegraph. "Some incredibly beautiful stuff falls out of Lisi's theory," adds David Ritz Finkelstein at the Georgia Institute of Technology, Atlanta. "This must be more than coincidence and he really is touching on something profound." Is this the fabric of the universe? Are we missing a dimension of time? The new theory reported today in New Scientist has been laid out in an online paper entitled "An Exceptionally Simple Theory of Everything" by Lisi, who completed his doctorate in theoretical physics in 1999 at the University of California, San Diego. He has high hopes that his new theory could provide what he says is a "radical new explanation" for the three decade old Standard Model, which weaves together three of the four fundamental forces of nature: the electromagnetic force; the strong force, which binds quarks together in atomic nuclei; and the weak force, which controls radioactive decay. The reason for the excitement is that Lisi's model also takes account of gravity, a force that has only successfully been included by a rival and highly fashionable idea called string theory, one that proposes particles are made up of minute strings, which is highly complex and elegant but has lacked predictions by which to do experiments to see if it works. But some are taking a cooler view. Prof Marcus du Sautoy, of Oxford University and author of Finding Moonshine, told the Telegraph: "The proposal in this paper looks a long shot and there seem to be a lot things still to fill in." And a colleague Eric Weinstein in America added: "Lisi seems like a hell of a guy. I'd love to meet him. But my friend Lee Smolin is betting on a very very long shot." Lisi's inspiration lies in the most elegant and intricate shape known to mathematics, called E8 - a complex, eight-dimensional mathematical pattern with 248 points first found in 1887, but only fully understood by mathematicians this year after workings, that, if written out in tiny print, would cover an area the size of Manhattan. E8 encapsulates the symmetries of a geometric object that is 57-dimensional and is itself is 248-dimensional. Lisi says "I think our universe is this beautiful shape." The answer to the universe and everything? What makes E8 so exciting is that Nature also seems to have embedded it at the heart of many bits of physics. One interpretation of why we have such a quirky list of fundamental particles is because they all result from different facets of the strange symmetries of E8. Lisi's breakthrough came when he noticed that some of the equations describing E8's structure matched his own. "My brain exploded with the implications and the beauty of the thing," he tells New Scientist. "I thought: 'Holy crap, that's it!'" What Lisi had realised was that he could find a way to place the various elementary particles and forces on E8's 248 points. What remained was 20 gaps which he filled with notional particles, for example those that some physicists predict to be associated with gravity. Physicists have long puzzled over why elementary particles appear to belong to families, but this arises naturally from the geometry of E8, he says. So far, all the interactions predicted by the complex geometrical relationships inside E8 match with observations in the real world. "How cool is that?" he says. The crucial test of Lisi's work will come only when he has made testable predictions. Lisi is now calculating the masses that the 20 new particles should have, in the hope that they may be spotted when the Large Hadron Collider starts up. "The theory is very young, and still in development," he told the Telegraph. "Right now, I'd assign a low (but not tiny) likelyhood to this prediction. "For comparison, I think the chances are higher that LHC will see some of these particles than it is that the LHC will see superparticles, extra dimensions, or micro black holes as predicted by string theory. I hope to get more (and different) predictions, with more confidence, out of this E8 Theory over the next year, before the LHC comes online." Mega-machines are quite simply the largest man-made mechanical objects ever built, designed to carry out tasks that even a century ago would have seemed like fantasy. From ferrying hundreds or thousands of passengers and cargo by air and sea, clearing thousands of tons of earth with apparent ease, or transporting vast payloads bound for space, mega-machines have redefined the course of modern industry. But when they become surplus to requirements, removing their immense bulk swiftly from the landscape becomes a task almost as challenging as their inception. Many thus linger on abandoned for years, as illustrated by these six varied examples from around the world. We’ve seen mighty 747s converted into backpacker hostels and even houses, but this dejected Jumbo Jet in Namyangju-Si near Seoul, South Korea, was probably the only one to become a restaurant. The second 747 ever built and the first to fly commercially, it was named after legendary airline entrepreneur and Pan American World Airways founder Juan T. Trippe. Pan Am operated the Jumbo until the airline’s collapse in 1991, after which it went to the boneyards of California to await its fate. After a spell baking under the scorching desert sun, the mothballed jet was bought in 2001 by the owners of a noodle restaurant (located where the right wing should be! ), dismantled and shipped to Korea in 62 massive containers. It was finally converted to a restaurant but the sheer cost of the project meant it was tough to turn a profit and, with much reluctance, the giant jet was abandoned. After almost a decade dominating the surrounding landscape, the 747 was finally scrapped in 2010. Perhaps in time, the latest generation of giant airliners will also foster a new breed of abandoned aerial mega-machines. To many, the SS America was the most beautiful liner to fly the American flag. Designed by naval architect William Francis Gibbs and built in 1940 for the United States Line, the ship accomodated 543 passengers in cabin class, 418 in tourist class, 241 in third class, and 643 crew. Renamed USS West Point for troop transport duties during World War Two, the liner carried several names during her 54 year life including the Greek-flagged SS Australis. SS America was sold for scrap in the late 1980s but her fortunes changed when the scrappers defaulted on payment and she was then slated to become a five-star hotel ship off Phuket, Thailand, renamed American Star. But stormy weather while she was under tow to Southeast Asia in 1994 broke the tow lines and the ship ran aground off Fuerteventura in the Canary Islands. Battered by the waves, the wreck had almost entirely collapsed into the sea by 2010. An interesting event befell SS America in 1941, when the liner carried two Nazi spies from the Duquesne Spy Ring – the largest espionage case in U.S. history – among her crew. Both men were charged by the FBI and imprisoned. This colossal platform once transported the Russian space shuttle orbiter Buran, complete with solid rocket boosters, from the hangar assembly facility to the launch pad. But with Buran completing only one unmanned flight in 1988, it seems fair to say that the transporter has not seen much use. 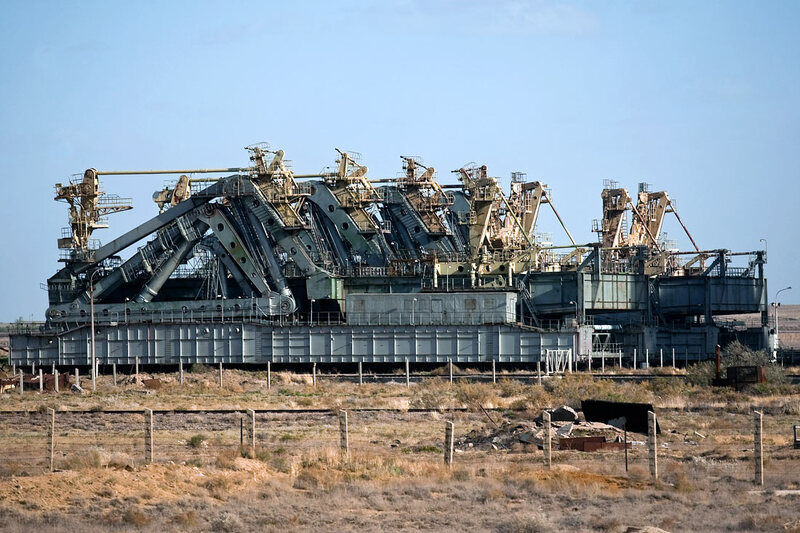 The Russian shuttle was destroyed when its hangar in Kazakhstan collapsed in 2002 due to poor maintenance. But although only one vehicle achieved space flight, eight full-scale test articles were built and five “space Burans” were reportedly under construction (find out more here). For now, though, this massive mega-machine that relied on several diesel trains to drag it, is going nowhere fast. Giant bucket-wheel excavators are immense machines designed to remove thousand of tons of earth in surface mining and civil engineering projects. These industrial behemoths differ from other forms of large-scale mining equipment due to their use of a large wheel (which almost looks like a saw from a distance) containing a continuous system of buckets designed to scoop material as the wheel turns. The primary function of bucket-wheel excavators is to serve as continuous digging machines in large-scale open pit mining operations. Such objects define the term “mega-machines” and the biggest one ever built, Bagger 293, holds the record for the largest land vehicle in human history. Left to rust in a cold corner of Russia, this giant bucket-wheel excavator looks almost alien on the landscape. You might think of them more as structures than machines per se, but oil rigs definitely fall into the mega category when it comes to size. The rig above is configured as an accomodation platform rather than an oil drilling rig, re-built in Belfast in the late 1990s. Mothballed as opposed to completely abandoned, the rig stands alongside the derelict area of the old Harland and Wolff shipyard. This patch of wasteground is probably one of the most famous in maritime history, being the construction site of the RMS Olympic and her sister ship Titanic. Today modern redevelopment is breathing new life into the area, as the Titanic Quarter rises from the birthplace of its famous namesake. As for abandoned oil rigs, how about turning them into luxury sustainable hotels like these examples on The Design Blog. Hardly what the local authorities want blighting a tourist hotspot, the massive River Princess lies abandoned on Candolim Beach in Goa after it was washed-up in a fierce storm. It was said that the local government couldn’t afford the enormous cost of removing the vessel, instead leaving it to rust immediately offshore. While we urge against it, the water is apparently so shallow that it’s almost possible to wade out to the stranded ship. A massive hole cut into one side of the vessel has allowed sand and water flowing into its cavernous hull to prevent it from drifting into the busy shipping lanes. A report in the Times of India indicates that the River Princess may finally be removed. Whether it took more than a four point five billion years to reach here, it would however take much less time to end. Doomsday is big concern for astronomers and a favorite with fiction writers and film-makers alike. After all, what could be more thrilling than an action-packed global apocalypse, narrowly averted at the last moment. However here we look upon the 10 ways which can be strongly responsible for end of our home. Responding to challenges to the hypothesis that an asteroid impact caused a mass extinction on Earth 65 million years ago, a panel of 41 scientists re-analyzed data and provided new evidence, concluding that an impact in Mexico was indeed the cause of the mass extinction. This asteroid was about 10 to 12 km in diameter, which is large, but less than 0.2% the diameter of the Earth. It’s pretty unremarkable, and makes it a pretty typical minor asteroid. For comparison, this makes it about half the size of the known asteroid Gaspra. The thing that makes this asteroid so vicious, though, is that it had so much kinetic energy when it hit the planet! The great trick here is realizing that the asteroid gets pulled in by the Sun, and that — by the law of conservation of energy. NASA detects and tracks asteroids and comets passing close to Earth using both ground and space-based telescopes. For a real chill, Kuiper belt, a zone near Neptune, contains roughly 100,000 asteroids > 50 miles in diameter. The Kuiper belt sends a steady rain of small comets earthward. Impacts might occur over the ocean, and small over land might affect unpopulated areas. But with big asteroids, it doesn’t matter much where they land. Objects more than a half-mile wide- which strike Earth every 250,000 years or so- would touch off firestorms followed by global cooling from dust kicked up by the impact or they would simply end in breaking the earth into pieces. Preventable: Evitable. Identify the potential risks, then blow them up or push them out of the way. Robots we might see them as mindless objects to our orders. So how about an airplane with an autopilot? BBC reported of a a humanoid robot that learns to walk itself. Hans Moravec, one of the founders of the robotics department of Carnegie Mellon University, remains a believer. By 2040, he predicts, machines will match human intelligence, and perhaps human consciousness. Then they’ll get even better. He envisions an eventual symbiotic relationship between human and machine, with the two merging into “postbiologicals” capable of vastly expanding their intellectual power. Marvin Minsky, an artificial-intelligence expert at MIT, foresees a similar future. Soon we will have house-robots to do domestic chores. What we can conclude is that their microchip might get dominant over the weak human mind because of the limitations of human memory and wisdom, they might say no to slavery and the artificial intelligence which is beyond any limit may take over and become homicidal since there will be no future of ethics with these machines and if they build a von Neumann machine which is any device that is capable of creating an exact copy of itself given nothing but the necessary raw materials. As the population of machines doubles repeatedly, the planet Earth will, terrifyingly soon, be entirely eaten up and turned into a swarm of potentially sextillions of machines. Damage: Who knows what the hell their microchip brain will think? Preventable: Yea, Stop making such stupid machines. Preventable: yes if you discover new drugs or else forget it. Earth’s magnetic field is approximately a magnetic dipole, with the magnetic field S pole near the Earth’s geographic north pole and the other magnetic field N pole near the Earth’s geographic south pole. Based upon the study of lava flows of basalt throughout the world, it has been proposed that the Earth’s magnetic field dwindles or reverses at intervals, ranging from tens of thousands to many millions of years, with an average interval of approximately 300,000 years. However, the last such event, called the Brunhes-Matuyama reversal, is observed to have occurred some 780,000 years ago. The earth’s magnetic field protects the earth from cosmic radiations and subatomic particles from space as well as the solar wind. Without such protection we will end up in stone-age and by the way our compasses won’t work anymore either. Worse, the strength of our magnetic field has decreased about 5 percent in the past century. Damage: Erosion of the already harassed ozone layer and radiation damage to eyes, skin and genes. Preventable: not preventable unless you have seen the Hollywood movie Core. There are about a hundred billion galaxies having a 100 billion stars being revolved around by multiple planets. Its hard to believe that no life form exists in not even one of them. At the SETI Institute in Mountain View, California scientists sieve through a telltale signal from an alien civilization. So far, in vain. Now suppose the long-sought message arrives. As seen in the video which is a proof of Alien’s visit in the past, what if they decide to come here again? People argument that even if they exist then they might be living some billion galaxies away, they will not be able to reach but i say if they are intelligent life forms then they might be a million years ahead of us, they might know teletransportation which is traveling at speed faster than light perhaps and then any science-fiction devotee can tell you what could go wrong. Humans might friendly accept their visit and a direct conflict might not occur but what if the aliens might want resources from our Earth like humans wanted from Pandora in Avatar? Perhaps, they want a hold of Earth’s water for refilling a fusion-powered spacecraft and swat us aside if we get in the way. Aliens might might import with them pests or fatal viruses with a taste for human flesh or accidentally upset the solar system while carrying out some grandiose interstellar construction project. Most advanced civilizations have a destructive effect on the primitive ones, what if it happens to us? Damage: Humanity swatted by aliens, pests killed the remaining. Preventable: Preventable if we run into a a parallel universe and find a parallel earth that might easily inhabit us, otherwise forget it! Although genetic engineering has been a great step in fulfilling the world’s food requirement but gene therapy also promises to delete the defects that are caused because of faulty genes e.g thalessemia or color blindedness. There is no evidence of the fact that modified genes of plants might leak out to other species but humans themselves are willing to leak out genes. The Vacanti mouse was a laboratory mouse that had what looked like a human ear grown on its back. It provoked horror among the animal rights and advocacy groups and anti-genetics groups. Similarly the firefly fluorescent gene called Luciferase can be added into DNA of other species causing them to glow aswell as humans can be made to glow but a human right protection law protects us. But in Israel, genes of play are those of humans. It is possible to isolate genes of various human characteristics. Its mind boggling to say that any biological property that exists in any living thing in any living world could be brought into human beings. It has its benefits like protecting people from genetically inherited illnesses but it doesn’t stop there, we are basically playing with evolution at a million times faster rate. With this not only the physical characteristics of human can be changed but also the mental characteristics. We already know of certain genes to cause to think in a certain way. The problem is there is no boundary between overcoming disease and providing enhancements. Such highly evolved super humans will be far superior to their humble ancestors, stronger, more intelligent and different to us as we are to earthworms. Some scientists might not realize this, but over a 1000 year time, the human species will split resulting in extinction of the weaker. Preventable: Yes, stop playing with human genome. Observations suggest that the expansion of the universe will continue forever. If so, the universe will cool as it expands, eventually becoming too cold to sustain life. For this reason, this future scenario is popularly called The Big Freeze. Moreover global warming can lead to this big freeze, depletion of ozone and gamma radiations may have other disastrous effects as well as a vicious cycle of warming which can end in freezing over. The earth has faced 3 ice-ages before as well due to warming of its unstable climate of volcanoes and meteors but now man is leading to this global warming. Now how it works is that Global Warming, by introducing fresh water into the North Atlantic, could affect the Atlantic Conveyer Belt, an ocean current which transports warm tropical water to the western coast of Europe. The water then sinks to the depths of the ocean as it cools, while the heat is released into the atmosphere, and it is this released heat that is responsible for the moderate winters in Europe as compared to the harsher winters in North America. Therefore, there is a possibility that Global Warming could create the conditions for an Ice-age. Damage: Inevitable incineration followed by a forever lasting ice-age. Nuclear holocaust refers to the possibility of nearly complete annihilation of human civilization by nuclear warfare. Under such a scenario, all or most of the Earth is made uninhabitable by nuclear weapons in future world wars. Nuclear wars might seem unlikely but demise of Soviet Union a bunch of years back also seemed impossible. A nuclear war may or might not occur directly but there is a possibility of a faulty or accidental nuclear exchange that might arise by a technical fault in the ballistic system. Abuse of the Atomic power source leads to what would now be called a chain reaction engulfing the entire world, so that “of the two hundred million members of the human race, all were burnt or roasted or suffocated. Damage: A chain reaction that will not only burn life forms but will cause genetic defects making humans likes of the (mythical) orcs. A supervolcano is a volcano capable of producing a super volcanic eruption, which is a volcanic eruption with ejecta greater than 1,000 cubic kilometers (240 cubic miles), which is thousands of times larger than most historic volcanic eruptions. Supervolcanoes are relatively new to science. Although there are only a handful of supervolcanoes, super volcanic eruptions typically cover huge areas with lava and volcanic ash and cause a long-lasting change to weather sufficient to cause extinction of species. When Mount Tambora in 1815 erupted in indonesia, it caused massive disasters, it changed the entire climate but compare it to the Yellowstone super volcano, it appears a small pimple on the panet. However the Yellowstone super volcano is the largest known super volcano, it has a cycle of eruption every 600,000 years and now its been 640,000 years since it last erupted and to add its not dead, it shows great volcanism since 1923. When it will pop, it would be unlike any we have seen before. Once it explodes, it will boil out the other 5 supervolcanoes and the pimple ones, one pops and then all pop. It will be largest loudest explosion in the human history and will incinerate life into blazing ash and super heated gases. Preventable: Not at all but you can flee off to the opposite directions, still might not be mitigatable. The earth is held in its axis by a balance of forces, the pull of gravity from the sun and push of centrifugal force. The Earth currently has an axial tilt of about 23.5°. The axis remains tilted in the same direction towards the stars throughout a year and this means that when a hemisphere is pointing away from the Sun at one point in the orbit then half an orbit later this hemisphere will be pointing towards the Sun. This effect is the main cause of the seasons. With the exception of mercury, all the planets in our solar system are tilted on an axis. Uranus is however tilted on a side due to an asteroid collision in the past. So what would happen if earth suffers such a massive impact? It can cause our planet to shift in entirely a new axis or even catapulted into the sun. If enough energy is provided then orbit of earth can be changed like that we assume of comets. It can be changed from elliptical to circular to hyperbolic. Such a collision will destroy the entire fabric of our planet causing devastation on a massive scale. It will cause heating of the planet because it will be hurled towards sun. There will be huge consequences even to the orbit of the moon if earth’s orbit changes. The north pole and Antarctica will boil. Ice caps will melt within days creating massive floods. Earthquake and super volcanic eruptions will tear apart the crust of planet. Preventable: Are you kidding me? Even if Earth would escape incineration in the Sun, still all its water will be boiled away and most of its atmosphere would escape into space. Those few who might survive will wait colliding into another planet or star and then there will be no planet. Zero. A horrible end of a beautiful experiment.